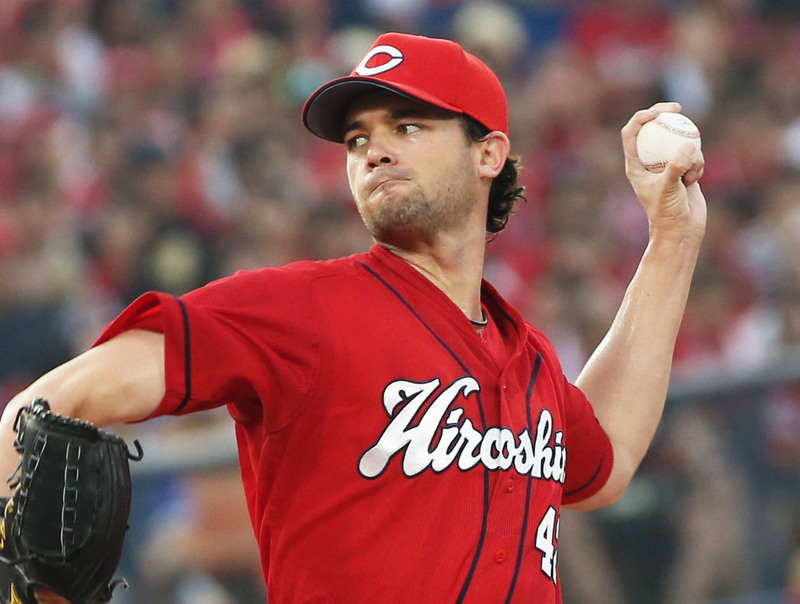 Kris Johnson and Miles Mikolas passed their first tests in Japan with flying colors. The two pitchers, Johnson, a southpaw who deals for the Hiroshima Carp, and Mikolas, a Yomiuri Giants right-hander, couldn’t have made better first impressions during their first seasons in NPB. Their performances last season should see them return to Japan full of confidence this year, when two hungry fan-bases will be eager to see if they can deliver an encore. The Carp could certainly use a repeat from Johnson. The team lost its ace over the offseason, having successfully posted Kenta Maeda to MLB, where he’ll play for the Los Angeles Dodgers. Without Maeda, there’s even more onus on the pitchers in the Carp rotation to step their games up. While celebrated veteran Hiroki Kuroda, himself a former Dodger, may get the lion’s share of the spotlight, Johnson is a key component. 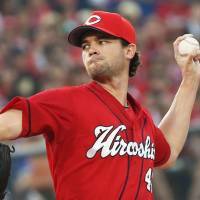 Johnson won 14 games last season, ending the year with an NPB-best 1.85 ERA. He was strong down the stretch, winning his last four decisions, allowing nine earned runs in 42⅓ innings in September and October. His numbers warranted more than the passing reference he got from the Sawamura Award committee — a reference that had to be squeezed out of the committee — when the prize was awarded, to Maeda, in November. Mikolas got off to a slow start with Yomiuri, falling to 2-3 after a loss to the Chiba Lotte Marines in June. He didn’t lose another game during the regular season, reeling off 11 consecutive winning decisions to finish 13-3 with a 1.92 ERA that was third best in Japan. The Giants need him to produce again, alongside right-hander Tomoyuki Sugano and big lefty Aaron Poreda, at the front end of their pitching staff in the team’s first year under new manager Yoshinobu Takahashi. But can Johnson and Mikolas do it again? Since 2005, nine foreign pitchers have won at least 13 games in a single season, five during their first year in Japan. Of that group, only former Giants and Marines righty Seth Greisinger did it again. Greisinger did it three times, actually. He moved to Japan after winning 14 games in South Korea in 2006, and went 16-8 with a 2.84 ERA for the Tokyo Yakult Swallows in 2007, leading the Central League in wins. Greisinger moved to the Giants and led the CL in wins again in 2008, finishing 17-9 with a 3.06 ERA. He won 13 games for the Kyojin in 2009. Nagging ailments derailed the rest of his career, though he enjoyed a brief comeback with the Marines in 2012, finishing 12-8 with a 2.24 ERA. Others in the aforementioned group followed their big years with very solid campaigns. Some were great again, but foiled by poor run support, the Hanshin Tigers’ Randy Messenger last season and former Chunichi Dragon Chen Wei-yin in 2011 come to mind. Others just didn’t get the breaks needed to get to 13 victories, which was the case for the Carp’s Colby Lewis, who won 15 games in 2008 and 11 in 2009 with an ERA below 3.00 both seasons. Of course there was also former Giant Dicky Gonzalez, for whom a 15-win year was an outlier and partial byproduct of a loaded Yomiuri roster in 2009. Johnson and Mikolas will enter 2016 as known commodities. Opposing players and coaches have seen both in action and will use that experience against them. They’ve shown what they can do for one season. The next test is consistency — an encore might even put them in contention to become the second foreign Sawamura winner, following in the footsteps of Hanshin’s Gene Bacque, who won the award in 1964.